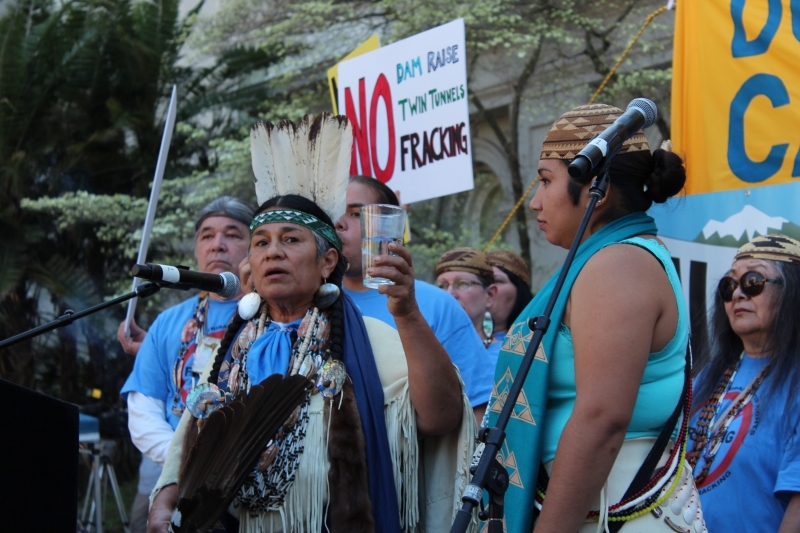 Hundreds of Indigenous Peoples from the state and throughout the country gathered with a crowd of over 4000 people at the State Capitol in Sacramento on March 15 to send a clear message to Governor Brown: ban fracking, an environmentally destructive oil extraction practice that pollutes groundwater, rivers and the oceans. The large Tribal contingent included members of the Miwok, Maidu, Winnemem Wintu, Yurok, Karuk, Hoopa Valley, Ohlone, Pit River, Cahto, Round Valley, Tule River, Pomo and Chumash Nations and other Tribes from throughout the state, as well as members of the Dakota, Lakota Sioux, indigenous communities, native organizations and activists in the Idle No More Movement and Klamath Justice Coalitions. 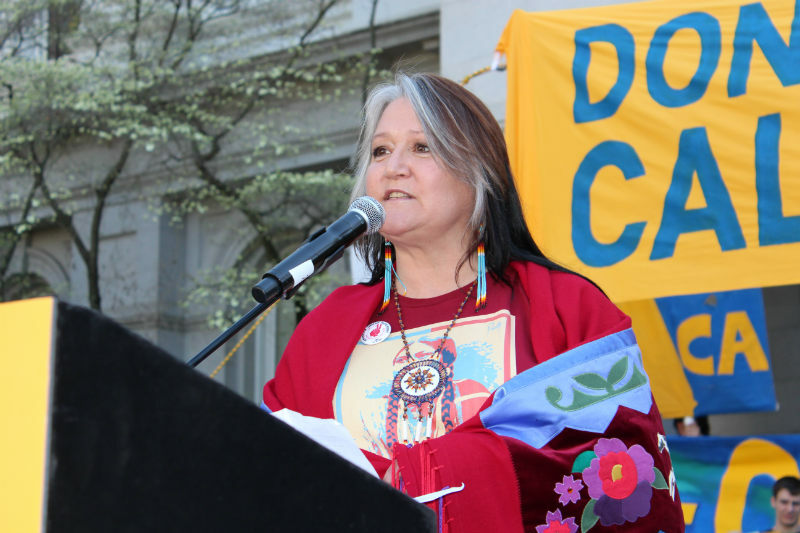 Many Tribal representatives emphasized the direct connection between fracking and the Shasta Dam raise and the Governor’s peripheral tunnels plan, which will provide water for fracking. “We should call the Governor ‘Westlands’ Brown,” quipped Chook Chook Hillman, a member of the Karuk Tribe and the Klamath Justice Coalition that has organized many direct action protests to remove the Klamath dams, halt the violation of tribal gathering rights under the Marine Life Protection Act (MLPA) Initiative to create so-called “marine protected areas,” and to stop the Westlands Water District legal attempt to raid Trinity River water. The event, organized by the Californians Against Fracking, featured diverse speakers including environmental justice advocates, farmers, student activists and other groups opposed to fracking. Hundreds of organizations, ranging from grassroots groups to large NGOs, helped to organized the rally. Chief Caleen Audrey Sisk, Tribal Chief and Spiritual Leader of the Winnemem Wintu, led the opening ceremony and prayer. She took aim at the Governor’s peripheral tunnels plan – the “Brown Water Plan,” as she calls it. After the rally was over she led a group of Winnemem Wintu and their supporters down to the Sacramento River at Miller Park take the “Water Challenge” to defend waters, rivers and fish population. Around 20 people cautiously waded into and then swam in the muddy waters. “I’m here for tribal water waters and to stop the raising of Shasta Dam. It’s the future – it’s our responsibilities as tribal people to stop fracking. Fracking is another broken treaty as far as I am concerned,” he said. Penny Opal Plant, an organizer of Idle No More, pointed out that the battle against fracking and other destructive methods of oil and gas extraction is a worldwide struggle, including Lakota resistance to the XL pipeline, the resistance of Canadian First Nations to fracking and battles of indigenous people against destructive resource extraction throughout Latin America. “Mother Earth is expecting us to be strong. We are her immune system. We are her cells activating on behalf of her fish, our two-legged relatives, those who fly and all of her life,” Plant said. She noted that the oil industry is planning ship dangerously explosive crude oil through Richmond, California – and vowed direct action to stop the trains. “We will put our bodies on the line and we may have to sit in front of the those trains,” Plant said. “Fracking” is a method of oil and gas production that involves blasting millions of gallons of water, mixed with sand and toxic chemicals, under high pressure deep into the earth to extract oil and gas but it can also pollute local air, water, and endanger the lives of people and wildlife, according to Corine Fairbanks, director of American Indian Movement Southern California Chapter. Fracking exposes people to radioactivity and numerous toxic chemicals such as lead, arsenic, methanol, and benzene. The chemicals used in fracking have been linked to infertility, birth defects and cancer. Fracking has been documented in 10 California counties — Colusa, Glenn, Kern, Monterey, Sacramento, Santa Barbara, Sutter, Kings and Ventura. Oil companies have also fracked offshore wells in the ocean near California’s coast, from Seal Beach to the Santa Barbara Channel. Fracking may have been used elsewhere in California, since state officials have monitored neither or tracked the practice until recently, according to Fairbanks. Fairbanks pointed out that Indian people have been fighting against hydraulic fracking and toxic dumping for many years. Gary Mulcahy, a member of the Winnemen Wintu Tribe, emphasized the connection between the raising of Shasta Dam, the peripheral tunnels and building of new dams that many tribal members and Delta folks made with their signs and banners at the event. “Fracking involves your water from north to south, from east to west, water that is ultimately controlled by big corporations, including agribusiness and oil companies. If fracking is bad, then so is raising dams, building new dams and building the tunnels,” he concluded. 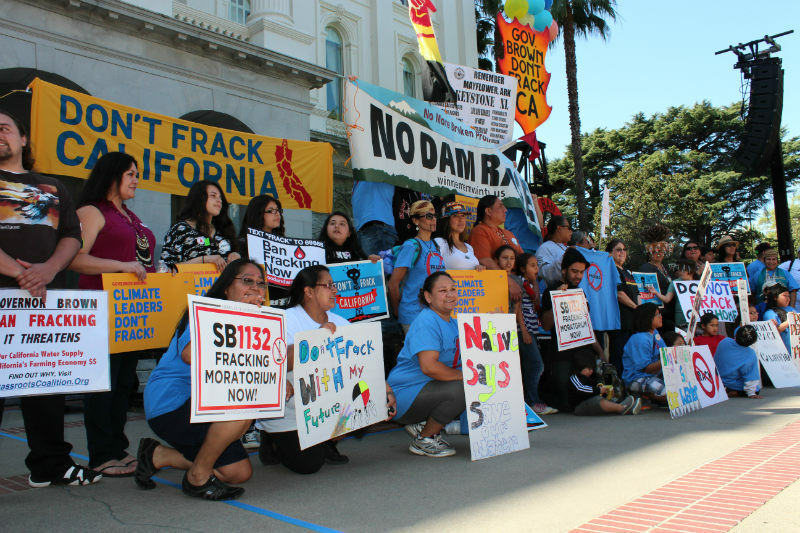 Hopefully, this highly successful rally will be followed by even bigger rallies and demonstrations in Sacramento and throughout the state opposing fracking, the peripheral tunnels, the Shasta Dam raise and the building of new dams. Adam Scow of Food and Water Watch, one of the co-founders of Californians Against Fracking, said anti-fracking activists will keep building the movement to put pressure on Brown to ban fracking. “Water is a human right and fracking is a violation of that human right, as are the twin tunnels,” Scow concluded. For those not familiar with the practice, fracking blasts massive amounts of chemical-laced water into the ground to crack rock formations in order to extract oil and natural gas, according to the Center for Biological Diversity. The process routinely employs numerous toxic chemicals, including methanol, benzene and trimethylbenzene. Oil companies have also fracked offshore wells over 200 times in the ocean near California’s coast, from Seal Beach to the Santa Barbara Channel, according to a Freedom of Information Act Request and media investigation by the Associated Press and truthout.org last year. WSPA President Catherine Reheis-Boyd served on the MLPA Initiative Blue Ribbon Task Forces during much of the time that this fracking of our marine waters was taking place. The Center cited two studies documenting the harm fracking poses to human health. Birth defects are more common in babies born to mothers living near fracked wells, according to a new study by researchers at the Colorado School of Public Health. In California, a recent Center report found that oil companies used 12 dangerous “air toxic” chemicals more than 300 times in the Los Angeles Basin over a period of a few months. Besides posing a big threat to human health, the pollution to California groundwater supplies, rivers and the Delta that will result from fracking and acidization will devastate already imperiled populations of Central Valley Chinook salmon, steelhead, Delta smelt, green sturgeon and other fish species. The Western States Petroleum Association (WSPA), the most powerful corporate lobbying organization in Sacramento, spent over $4.67 million, more than any other interest group, while lobbying state government in 2013, according to data released by the Secretary State’s Office and compiled by the Capitol Morning Report. Another oil company giant, Chevron Corporation and its subsidiaries, spent $3.95 million, the third most spent by any group on lobbying state government in 2013. Chevron also spent much of its money on lobbying against bills that would ban or regulate fracking in California. Since it is the most powerful corporate lobby in Sacramento, the oil industry is able to wield enormous influence over state and federal regulators and environmental processes. The result of this inordinate money and influence is the effective evisceration of the Marine Life Protection Act of 1999 during the MLPA Initiative process and the signing of Senator Fran Pavley’s Senate Bill 4.